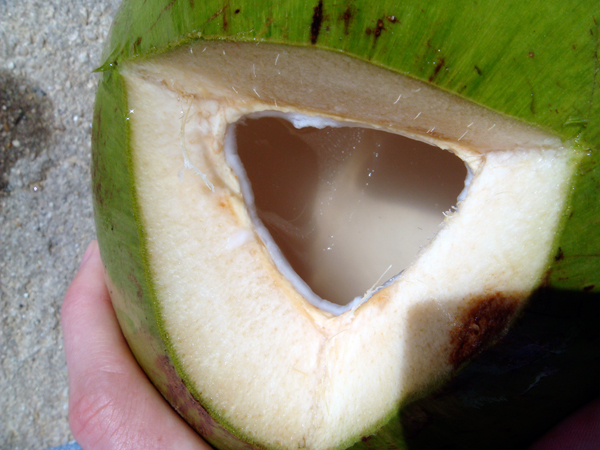 Fresh coconut water is delicious. wait, that’s not a fact. 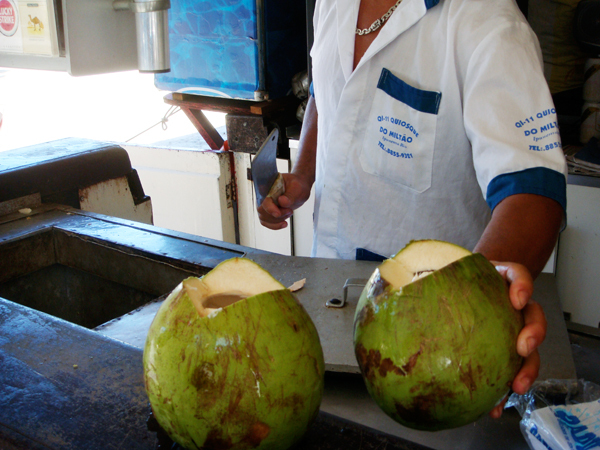 Fresh coconut water is sold by the beaches in Rio and it’s really good for you. 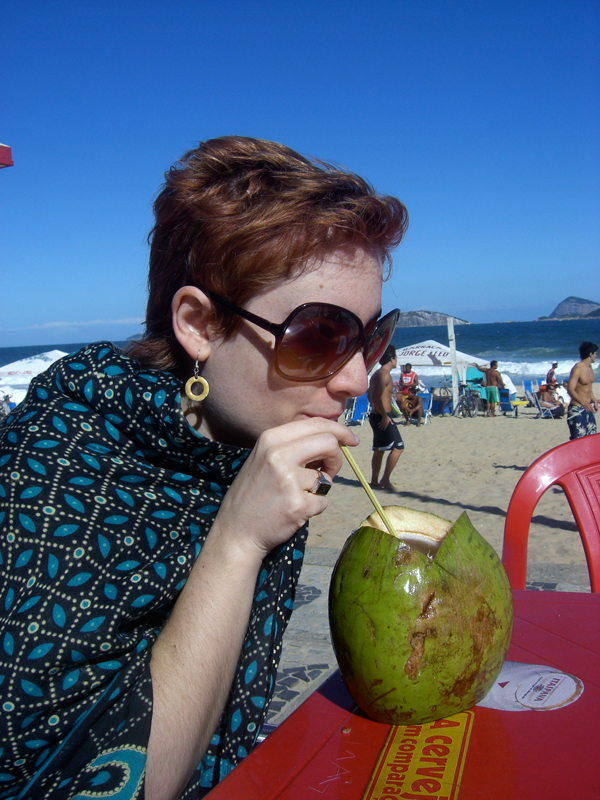 I went to Rio for a weekend in March-ish of 2008, and one of my strongest memories of the trip is fresh coconut water. It was so hydrating, so tasty, so fresh. My Rio comrades and I drank it several times a day. I miss it dearly now that I think about it. I miss it so much that I may or may not have purchased young coconut water at my amazing local farmer’s market. 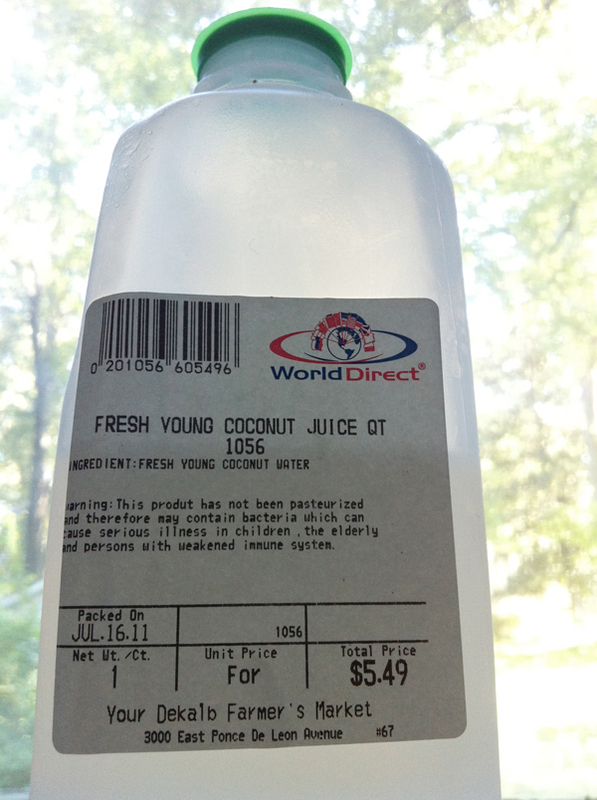 I wish I had seen this video before I bought the juiced version, because cutting open the full coconut at home is much cheaper than paying for juice plus labor. Plus I would have felt more accomplished. I know this is a budgeting blog, but I definitely just returned from drinking two delectable cocktails from delectable-cocktail-capital of Decatur, Leon’s. 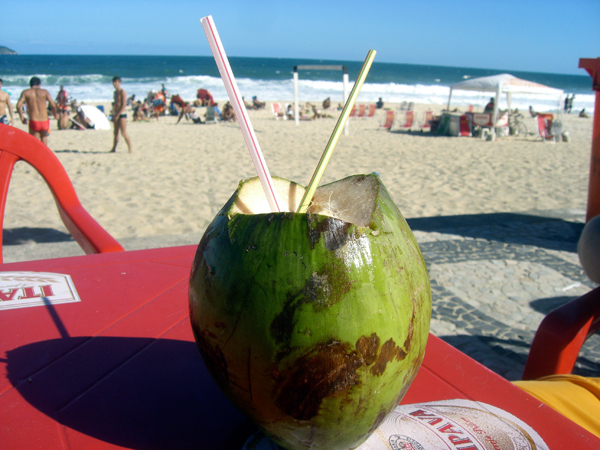 If you are a whiskey drinker, and you find yourself in Brazil, get ready to drink your whiskey with coconut water as a mixer! The plus– you will be preventing next morning’s hangover as you drink! My personal favorite drink, using coconut milk and condensed milk (as well as lots of fresh lime juice and cachaça) is called a Nevada. The sweet and sour deliciousness is incomparable (see a recipe version below). I’ll add here that Brazilians claim their country is actually six countries in one due to the vast regional differences. So, to rep (or rap) for the Northeast region I’ve included the link for Pitu, which people here in the NE drink religiously (and at 2 USD a bottle, sometimes dangerously). wow, cara, what awesome info! I obviously need to have a Brazilian cocktail party to celebrate saving before I leave and to build tolerance for your bday celebration time!! (which needs to be the entire week, if not the entire month). I do not want to end up like hombre in the last video, but if I do, please do film it and post on YouTube. 😉 Also, muito obrigado for the links in Portuguese–I’m definitely trying to learn some before I come! What about as an ingredient in amazing cherry frozen yogurt, or am I jumping the gun? Taking a cue from you I put some coconut milk with strawberries and honey in homemade popsicles. Amazing.